The best season to delight your taste buds with a refreshing and multicolored salad of tomatoes with basil and other incredibly tasty fresh tomatoes recipes? That’s because in-season and locally-grown tomatoes have two times more vitamin C than the tasteless, hothouse-grown ones; vitamin C is one of the wondrous nutrients that contribute to the many weight loss and health benefits of tomatoes. Do you know where’s the highest vitamin C concentration in tomatoes? It’s in the greenish, jelly-like stuff surrounding the seeds, with the amount of vitamin C varying depending on the tomatoes’ type. Out of season, choose the vine-ripened ones or use preserved tomatoes. Why use preserved tomatoes? 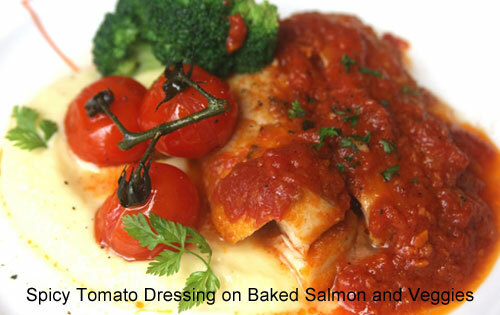 Because lycopene, tomatoes’ most valuable nutrient, is not destroyed during cooking. …along with starches (bread, pasta, potatoes, beans, peas, lentils, rice, corn) because these combinations create high acidity in your stomach, causing poor digestion and heartburn. 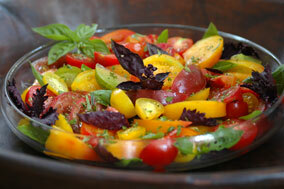 For an immediate boost in energy, include fresh tomatoes in any fruit or green salad. To keep things colorful, use as many colors you can find: yellow, orange, green, red, and purple. For a sweeter and more delicate taste choose cherry or campari tomatoes. 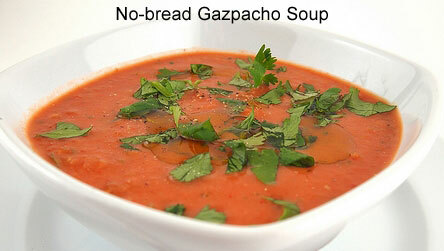 Do you like the famous Spanish Gazpacho soup? Originally, this isn’t among the recipes for fresh tomatoes, but here’s how to make a much healthier Gazpacho soup without cooking. And, with a simple change you can adapt this typically calorie-laden dish into a creamy and satisfying fat-burning meal. Blend everything in a food processor and chill for 1-2 hours. Serve the soup sprinkled with chopped spring onion, basil and cilantro. Slice the larger tomatoes into wedges and the smaller ones in halves and place them in a shallow bowl. 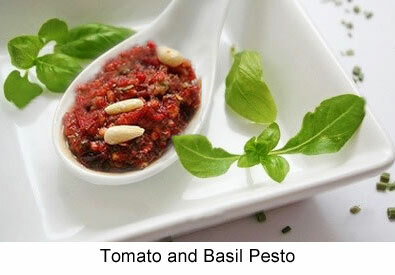 Mix well the smashed garlic, lemon juice, balsamic vinegar and olive oil and pour this mix over the sliced tomatoes. Sprinkle the chopped marjoram, salt and pepper and toss gently, then lay green and red basil leaves on top and serve immediately. Using the above quantities will give you 5-6 servings. Impress your guests with this savory spread on grilled chicken breast, salmon, shrimps or zucchini… Or, simply use it as a high-energy addition on your morning toast or scrambled eggs for a truly exquisite flavor. Place all ingredients in the blender and mix for 1 minute or until everything is well mixed. For an amazingly appetizing look, you can spread it on the meat or veggies right before grilling, or to preserve more of the health benefits of these fresh ingredients, add it just before serving. You can store any extra pesto in refrigerator for up to two weeks. This is one of the easiest recipes for fresh tomatoes that combines the many health benefits of tomatoes with the thermogenic effect of jalapeno peppers – one of the notorious negative calorie foods. Use this tasty, energizing and fat-burning dressing over raw or steamed vegetables, grilled shrimps or fish, roasted veal or lamb or on any green salad. You can keep this spicy tomato dressing in the fridge for up to a week.